It feels really good to have achieved such a huge personal goal. But I don’t think I’ll do it again. I may run more marathons, but with more preparation, and definitely not until I’ve reached my goal weight of 83kg or less. What I won’t do again is run for five hours, the last two in serious pain. That’s just nuts. 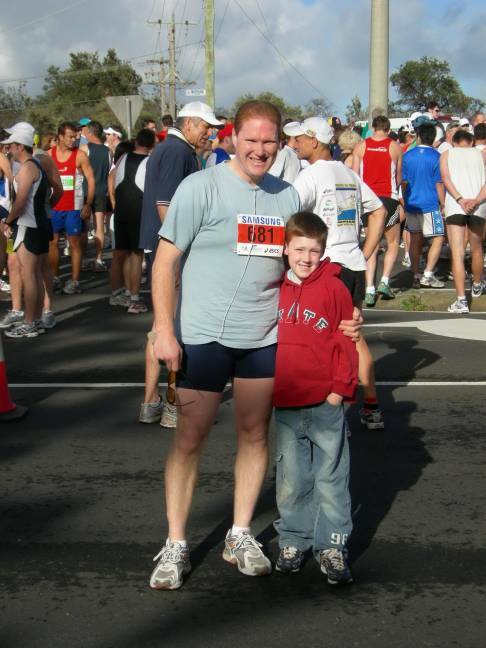 Daniel with me at the start. Footnote: The weather was absolutely perfect! A bit of drizzle at the start, 10 deg C, bright and sunny with a max of 17 by the time I got to the city, and a howling (20-30kt) cool southerly the whole way. I only caught a bit of a headwind after turning at the Beach Rd-Nepean Hwy roundabout, and then only for a couple of minutes. The rest of the time the wind was at my back and constantly cooling me down. A runner could not ask for more! Especially after a week of high-20s and more 25-30 days forecast for the coming week. 1 5.25 152 Too Fast! Slow down! 3 5:58 143 That’s more like it! 32 9:28 145 had to start walking halfway through this one. The cramps have hit. 34 8:51 137 well, at least I’m not going too fast anymore! 38 8:53 145 able to do a bit more running. Hi Bobby! 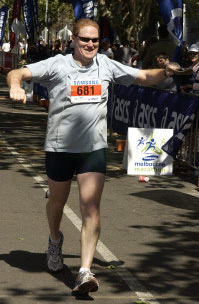 I ran in the inaugural Run for the Kids fun-run on Palm Sunday. I wasn’t sure if I would even start, as I had injured my hip two weeks before: I went to bed on the Saturday night feeling fine, but woke up on the Sunday morning and I could barely walk. Turns out I had somehow irritated my right hip joint, and the muscles around it had kicked in to protect it. In particular my rectus femoris was extremely tight. But with a few physio sessions over the following week with the amazing Steve Evans at the Alphington Sports Medicine Clinic, I was back running 3km the next Wednesday and 6km on Friday. The R4K was 14.7km over a spectacular course: over the Bolte Bridge, through the Domain Tunnel (which was very hot and humid) and through the City to the finish at the Childrens’ Hospital. I finished in 81m 39s, which really surprised me as I was expecting to run a lot slower. I honestly felt like I was running much slower than that – my average heart rate for the run was 157. I guess all the training is paying off.